When in Japan, a visit to the hot spring is a must. A good place to go for a dip is Dogo Onsen—one of Japan’s oldest hot springs previously frequently visited by the imperial family. Today, the Dogo Onsen remains a popular bathhouse spot bustling with both tourists and locals and it is said to have lent inspiration to the animated film “Spirited Away”. Constructed on Mount Katsuyama, Matsuyama Castle—one of the twelve preserved castles in Japan—is a stunning architectural feat which served as a fortress for the Katoh, Gamoh and Matsudaira family between 1603 to 1868. Built by hand from stones brought over from the Yuzuki and Masaki Castle and its surrounding areas, spend time diving deep into the castle’s history, explore the hidden windows where archers once stood and enjoy vast views of the Ehime prefecture’s landscape at the top of the castle. Located within Tatara Shimanami Park, delight in Michi-no-eki Tatara Shimanami Park’s Iki-umi Gozen Set (¥1620/ S$19.31) which stars tasty and crispy sardine and conger tempura. You can also add on a plate of fresh and juicy squid sashimi for ¥2160 (S$25.75). 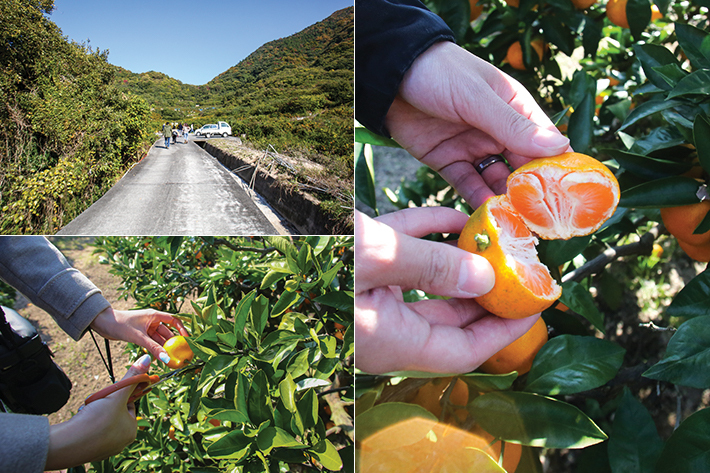 A trip to a mikan farm should not be missed especially when in the Ehime Prefecture — the Citrus Kingdom of Japan. For just ¥500 (S$5.96), mikan lovers can pick endless mikan with no time limit imposed, subject to all mikan being consumed onsite. Advance bookings are required. During the Edo Period and Meiji Period, the town of Uchiko prospered through the manufacture of vegetable wax and paper. Embark on a 20-minute paper making tour at the Tenjin Paper Factory (¥500/ S$5.96) where participants have the chance to make washi paper through traditional techniques. Advance reservations for the tour are necessary. A well-known speciality of the Ehime prefecture, Taimeishi (¥1000/ S$11.92)—done Uwajima-style—comprises thinly-sliced sea bream sashimi, raw egg, sesame seeds and chopped green onions layered over a bowl of fluffy rice. Set aside as a Historic District Preservation Zone, Uchiko is an example of living history. Walk along Yokaichi Old Town—Uchiko’s preserved street of houses—which remains unchanged since Uchiko’s days as a vibrant hub for wax and paper production. Another place you must visit in Uchiko is Uchiko-za. Built in celebration of Emperor Taisho’s accession in February 1916, it is a two-storey wooden theatre which was and continues to be home to various traditional Japanese performance arts such as kabuki, bunraku and rakugo. Your trip to Japan would not be complete without a traditional multi-course Japanese dinner: Kaiseki. A highly recommended dining establishment for Kaiseki is Yugao, a quaint Japanese restaurant nestled on the third level of Yamatoya Honten. Some highlights of your meal include a selection of sea bream, bonito and shrimp sashimi and a personal wagyu grill. A quintessential Japanese folk dance, immerse yourself in Awa Odori—a traditional Bon dance performed during summer. At the Awa-Odori Kaikan Hall, visitors will be treated to performances such as “The Dance Past and Present” and “Nature Themes” by Awa No Kaze—a dance group exclusive to the facility—and will have the chance to join the group on stage after a step-by-step introduction to the dance. A suspension bridge composed of mountain vines across the river of the Iya Valley, the Iya Kazura Bridge is a gorgeous bridge that deserves a visit. Legend tells the tale of the bridge being a vital transport system and of the bridge being constructed by refugee Taira clan members during the Gempei War. However, as the gaps between each wooden plank of the bridge are rather large and will be slippery during the rainy season, proper footwear is recommended for those keen on crossing the Bridge. 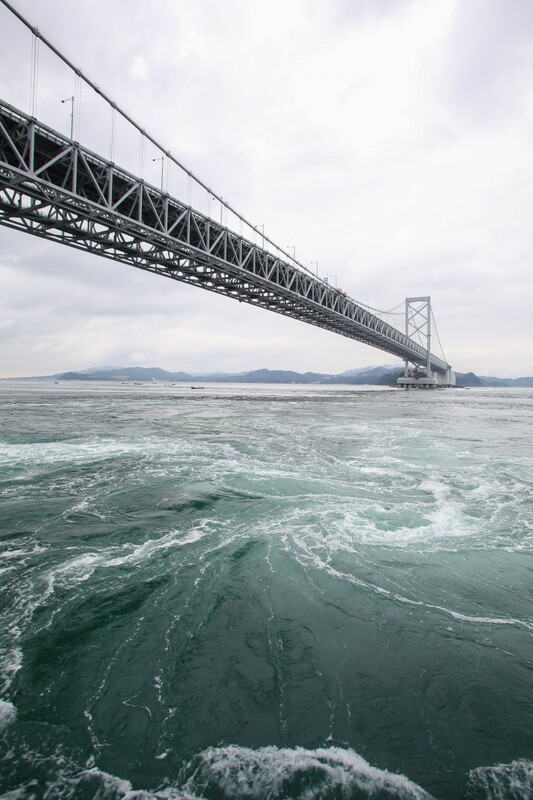 Tidal whirlpools that occur along the Shikoku coast of the Naruto Straits, the Naruto Whirlpools are created from the meeting of currents between the Seto Inland Sea and Pacific Ocean. As the size of the whirlpools may vary according to weather conditions, we highly recommend you to check the whirlpool schedules prior to your visit. Awarded the status of both a National Nature Treasure and National Scenic Spot in Japan in 2014 and 2015 respectively, the Oboke Pleasure Cruise is a must-do for all visiting Tokushima. You will be transported to a paradise overflowing with tranquillity and serenity created by the rows of massive rare crystalline schists which line both sides of the Yoshino river. And for those who are enthusiastic about natural rock formations, look out for “Rock the Lion”—a giant rock reminiscent of a lion’s head. For the ultimate okonomiyaki experience in Hiroshima, Okonomimura—an okonomiyaki village—would be worth your time. Among the 24 stalls in Okonomimura, our favourite was Suigun: a 40-year-old family eatery which has been in operation since the establishment of Okonomimura. An okonomiyaki set incorporating ingredients such as pork, prawn and squid is priced at ¥1,350 (S$16.0). At 8.15am on 06 August 1945, the first atomic bomb in the world changed the fate and lives of the people living in Hiroshima. In commemoration of the lives lost and severe suffering which ensued from this tragedy, the Hiroshima Peace Memorial Park stands as testimony to the urgent need for diplomacy and world peace over violent confrontation. After visiting the park, make your way over to the Hiroshima Peace Memorial Museum to hear the untold stories of victims of the atomic bombs, examine their personal belongings and relive the horrors of the past through interactive exhibits. Daisho-in Temple presently serves as the headquarters of the Omuro Branch of the Shingon denomination of Buddhism. With 27 different religious sites within the Daisho-in Temple, visitors will leave Daisho-in Temple with a comprehensive understanding and refreshed perspective of Buddhist teachings. During your visit to Miyajima Island, there are plenty of eateries selling a waffle shaped like a maple leaf filled with various fillings: the Momiji Manju (¥150/ S$1.79). Filling flavours to try include cream cheese, custard cream, Adzuki bean jam, green tea and chocolate. Another popular eatery to look out for is Itsuki Coffee, a space managed by the only coffee roaster on Miyajima where you can find freshly roasted and brewed coffee and the Hattendo Cream Pan. 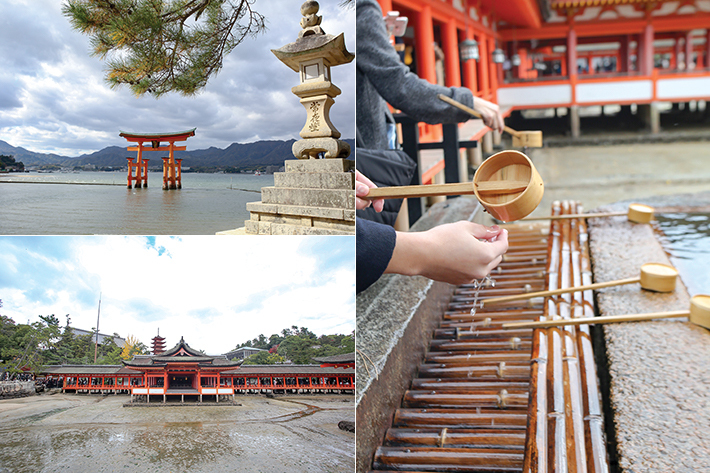 Designated as a UNESCO World Heritage Site since December 1996, Itsukushima Shrine is an excellent example of Shinden-style architecture and spans across a corridor of approximately 280 meters and 20 buildings. And just 200 meters ahead of the Itsukushima Shrine is the O-Torii Gate—one of the most iconic landmarks of Miyajima. Depending on the time of visit and the levels of the sea, visitors may have a chance to walk right up to the O-Torii Gate. Miyajima’s oyster farming industry boasts a rich history of more than 330 years and their oysters are known for their excellent flavour, taste and texture. Do also save some tummy space for Anago Meshi—eels from Onoseto which are extremely tender and flavourful. The Kurushima-Kaikyo Bridge—the longest suspension bridge structure in the world—connects the Hiroshima Prefecture and Ehime Prefecture. If you are up to the challenge, you may cycle a 7km route across the bridge which will reward you with a bird’s eye view of Hiroshima’s islands. There is no good way to sum up the beauty and wonders of Hiroshima, Shikoku and Setouchi because no words could do justice to how enchanting this region in Japan is. Their scenic attractions are beyond breathtaking, their cultural sites so rich with heritage and the food, phenomenal. Awake the explorer in you and opt to travel to this undiscovered region in Japan as compared to Japanese cities which are constantly overflowing with tourists and crazy human traffic. Sit back, relax and as we said earlier, take the road less travelled. You will definitely not regret doing so. This post is organized by Setouchi Tourism and sponsored by Ehime.